Sorry I was MIA yesterday! Time escaped me! Remember when I spoke about The Brush Guard here? Well, I ordered them a few weeks ago and received my combination pack from Coastal Scents this week. I only had one problem with package I ordered and that's because one of the eyeshadow guards was split at the top. I can overlook it for now, but I'm hoping the split does not spread further down rendering the guard useless. I tried them right away! I have to say that I am quite impressed. My contouring brush looks better now than it even did when I bought it! I swear! Obviously with often use, your brush is going to get out of shape. This product absolutely brings it right back to its natural shape. 1. I spray my brush with a makeup brush cleaner. I use one by Sephora. 2. They say to use a towel or tissue to clean off the makeup from the brush. TIP: Instead, I actually use makeup remover wipes from Sephora. I find that the double dose of cleanser and remover really gets pretty much every bit of makeup off of the brush. 3. 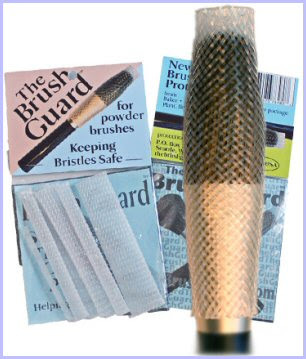 You slide the bottom of the brush into the Brush Guard and slide it up. Put the brush in a cup bristles down and allow it to dry overnight. 4. Never slide the Guard off the way that you put it on. That pulls the bristles back and causes flaying.